When people hear about babies saved from abortion, it motivates them to trust God — and participate in 40 Days for Life. After all, how often do you have an opportunity to literally help save a life just by peacefully praying? … 35 times (that we know of)! A young man came out looking for her. The barefoot runner was his girlfriend, and she was there for an abortion. Eventually, she was found nearby, and vigil participants offered to get her something to eat. When they sat down to their meal, the young woman told her story. .. she simply couldnt go through with it. 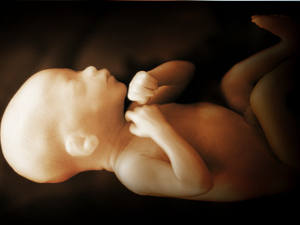 “God’s grace poured into her heart,” said one of the 40 Days for Life volunteers. The young woman found the strength and courage to remove the needle from her arm, to quickly get dressed (except for her shoes!) and run out to safety. 40 Days for Life participants in Houston say the campaign has been quite eventful already. There’s a mobile pro-life pregnancy counseling center in Houston, and it is often parked outside Planned Parenthood’s huge abortion facility. Women arriving for appointments at Planned Parenthood are offered assistance in this vehicle, and volunteers say many of these women are willing and eager to listen. Two abortion-minded women visited the mobile center. One of those two made a huge turn around after seeing her unborn child on the ultrasound image and chose life. The other simply said she would think about it, so she was given information about pro-life resources. Please keep her in your prayers. One of the 40 Days for Life volunteers in Milwaukee watched as a couple pulled into the parking lot at the abortion center. The woman got out and walked into the building while the man remained at the wheel of his truck. So one vigil participant walked over and struck up a conversation. Eventually, the volunteer started talking about his dad, who was born during the Depression, less than nine months after his grandparents got married. The man went back inside again, and finally the couple came out together — smiling — and got back into their vehicle. “We didn’t get it!” he said. “Amen!” said the 40 Days for Life volunteer. “Amen!” replied the guy in the truck. Prayer intention: Pray that those tempted to abort may understand that their child is already present, and already a real person. Scripture: And it happened, when Elizabeth heard the greeting of Mary that the babe leaped in her womb; and Elizabeth was filled with the Holy Spirit. Then she spoke out with a loud voice and said, “Blessed are you among women, and blessed is the fruit of your womb! But why is this granted to me, that the mother of my Lord should come to me? For indeed, as soon as the voice of your greeting sounded in my ears, the babe leaped in my womb for joy” (Luke 1:41-44). Now if one is expecting a package, the package is not yet there. As reflected in our verse for today, however, this is not the case with the mother. Her gift is already there. The pregnant woman, a mother already, does not have a child “on the way,” but has a child, already present and in full possession of his or her human rights, starting with the right to life. Prayer: Jesus, open my eyes to your presence in the life of every child. Open my heart to joy in the birth of every child, a birth that reflects the joy of your own birth in Bethlehem. As you shared life in the womb of Mary, so now send your protection upon every child still in the womb, and grant to their mothers the strength and joy that comes from welcoming the gift of life. We pray through Christ our Lord, Amen.